Garuda is the king of Birds and is considered to be an important deity in the form of Animal or bird, which has evolved in the Vedic history. It represents a bird like icon with the body of a human being, white head like that of swan and red feathers. This is the usual form which is seen in temples and as explained in mythology. Being a vahana or vehicle of Lord Vishnu, this deity is worshipped by all the devotees of Lord Vishnu. Legends unfold the story that Garuda was born or rather hatched from an egg which was laid by his mother Vinata. His father is Lord Kasyapa. When he hatched out of the egg a unique form was found which had never been seen before. The child had the body and limbs resembling that of human being, tail, head and beak like that of eagle, along with bright red feathers and the body was entirely of shiny golden color. In fact, for an instant he was mistaken to be Agni. 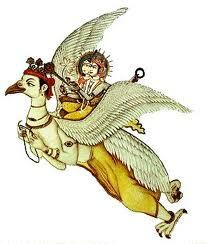 Garuda is also considered to be the lord of winds since it can fly at a speed which is much greater than that of winds. There is a legend as per which Lord Garuda brought a sort of amrit for the Nagas in order to release his mother, who was captivated by them. Since, he got the amrit which made Nagas or the serpents immortal, they too worship Lord Garuda. He is known for his immense power, strength and agility. 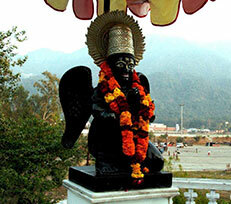 One of the important feature of Garuda that it has no beginning or ending and hence considered to be an eternal form. This is the probable reason of using it as a symbol as a martial motif. Indian army also uses Garuda as the symbol for ranks of Commandos. 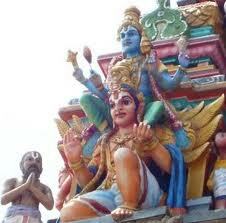 In Andhra Pradesh a rock has also been named after the deity to Garuda rock. Garuda Panchami is one of the famous puja's which is dedicated solely to Lord Garuda. This is usually observed by women for their children and for their husbands. The puja follows a strict procedure. After cleaning the puja room and decorating it with flowers, a wooden stand which is purely clean is placed. On it a banana leaf is placed and some cooked rice is served on it. In the middle of the rice, an idol of Aadiseshan made of gold or silver is placed. Then nearby to the entire setting a small idol of Lord Ganapathy is built out of haldi and then the usual procedures of rituals are done by chanting hyms and performing the aarti.